Rachel Glarner reimagines the ancient ritual of burning sage with her heavenly scented candle. For thousands of years, people have burned dried sage to bring positive energy to a new home, or during meditation. Rachel Glarner reimagines the ancient ritual with her lovely candle. The heavenly scented soy wax blend features notes of cedar, sage, and lavender. 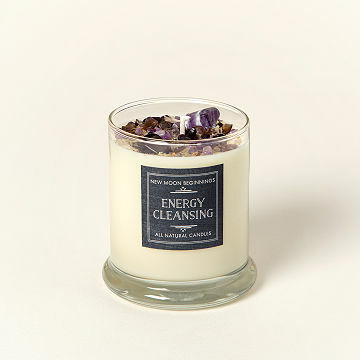 Finished with a layer of dried herbs and lilac crystals, the candle looks as pretty as it smells. Give it to a friend who's just moved, or someone whose spirit could use a lift. Handmade in Pennsylvania. Rachel Glarner holds a Master of Business Administration from the University of Pittsburgh, but what really inspires her is aromatherapy and crystals. "My life and shop are filled with the beauty and energy of crystals," she says. She opened a small candles, jewelry, and aromatherapy shop to help bring those same feelings of calm to the world. All of her pieces are inspired by the world around her whether it's something she saw in nature or a moment with customers or loved ones. She lives and creates in Pittsburgh, Pennsylvania. 3.25" H x 3" dia. ; 12 oz. Trim wick to 1/4" (7mm) before lighting. After my first purchase, I returned to your site and purchased many more. This candle is the ideal gift for so many people. It is unique and beautiful. Although lovely visually, there is no scent. Disappointed. Candle is nice. Love the smell. A bit spendy for the price, but it is quality made. I will probably buy more. Haven't given this to my friend yet but it is very pretty and smells nice. It's just a bit pricey for a candle but it's a nice gift! I absolutely love this candle. I will splurge and buy another, when it becomes time. I use it in my yoga room to light during meditation. Or when practicing yoga. Gives nice ambiance and scent. This is seriously the best smelling candle ever. After buying it as a gift, I quickly bought two for myself. I'm burning one as I right this review and I'm in heaven. Literal. Heaven. product arrived ontime and in good shape. The scent is absolutely amazing, I wish there were more like this. A pretty little candle with a light pleasant scent.